Running in Charlotte, North Carolina. 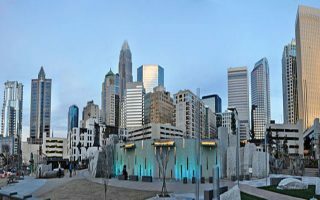 Best routes and places to run in Charlotte. 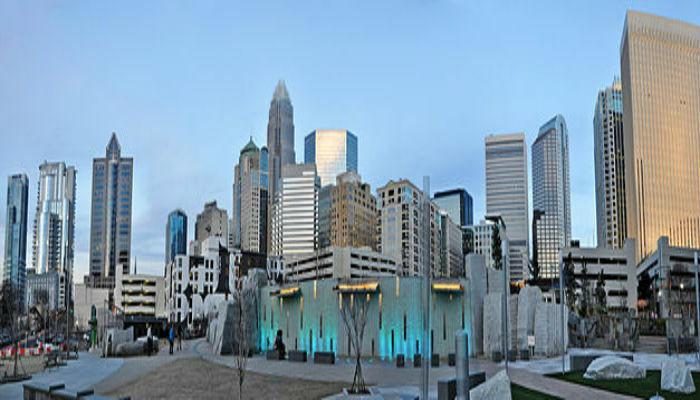 Charlotte is a fast-growing city and the second largest banking center in the United States. If you’re in financial services…you’ll end up in Charlotte at some point. Charlotte is fairly spread out. This is our guide to the best places to go running in Charlotte, North Carolina. There are good running options right downtown, but a car will help you access a wonderful network of trails surrounding the city. 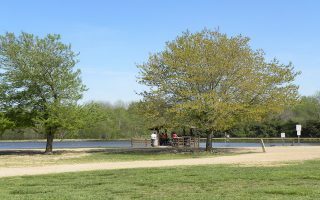 A system of greenway trails is constantly growing and provides miles of options for recreation, transportation, and fitness. 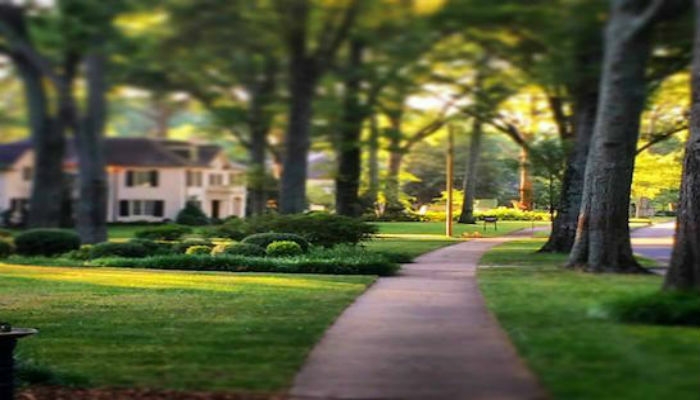 In addition to the Greenway trails, Charlotte running highlights include historic architecture and lovely residential neighborhoods, a well developed trail alongside the Trolley, and some terrific trail running opportunities. Charlotteans say “Beer is the perfect post-run recovery beverage”. Because of this, there are numerous brewery group runs almost every day of the week. 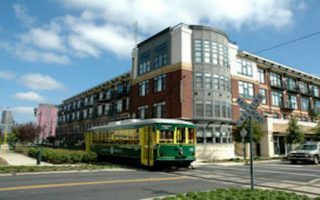 Public transport in Charlotte is mainly downtown and includes buses and a trolley (and the trolley running trail!). The Uptown Shuttle provides free transportation to the Convention Center and most hotels, but if you need to get about, a car is needed. Downtown in Charlotte is ‘Uptown’. 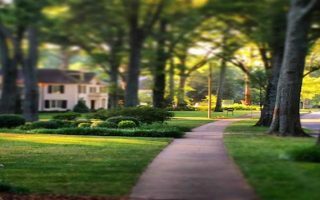 This route features a variety of urban green spaces as well as numerous Charlotte landmarks (Stadiums, Convention Center, Museums). The 3.5 mile paved path runs along the Light Rail, winding from Uptown Charlotte to South End, passing breweries, art galleries, and hip eateries and bars. A good way to explore Charlotte on this ~3 mile multi-use path that goes through several parks and residential areas. A full loop, including Freedom Park, is 5.6 miles. 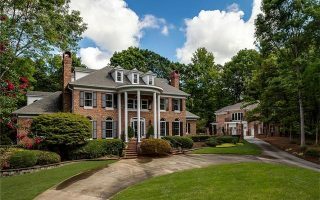 This 5.5 mile route features the lovely streets and homes of Dilworth, beginning Uptown in Marshall Park and runs down Little Sugar Creek Greenway to Freedom Park. Suburban Running Delight: Sharon Rd. West-Gleneagles Rd. About 10 miles south of downtown, one of the more pleasant ‘straight shot” running areas through pleasant residential neighborhoods is to take Sharon Rd. West to Gleneagles Rd. 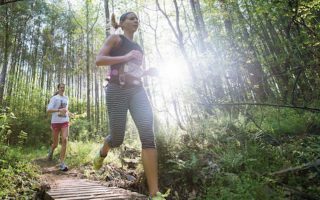 Explore 20+ miles of woodland trails extending along the Catawba River at the U.S. National Whitewater Center tabout 20 minutes West of Uptown. 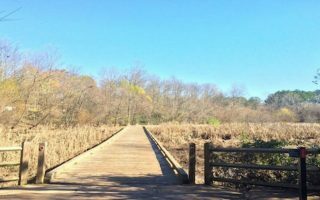 Local runners recommend the marked 5K championship cross-county course at McAlpine Creek Park, 15 minutes southeast from Uptown. 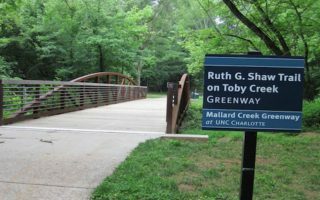 One of the longest stretches of greenway in Charlotte, Mallard Creek and Clark Creek connect for just over 7 miles of uninterrupted running trail. 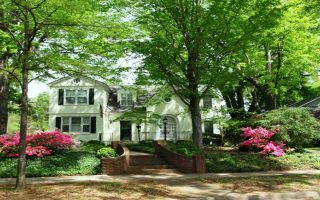 A 5.8 mile, well-shaded escape from the nearby population center that’s grown up along the south end of 485, about 10 miles south of the city. 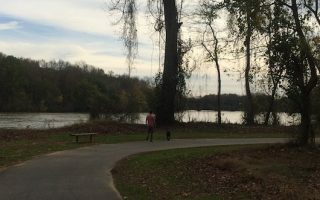 Pleasant 4.4-mile out and back trail along the Catawba River in the Rock Hill/Riverwalk area. Nice water views and shade. Near the cluster of hotels off I-77/Highway 21. Connects to other trails around nearby River Park. Charlotte has a humid, subtropical climate. Summers months are are hot and humid, with highs averaging 90F with warn nights. Make sure you hydrate appropriately. 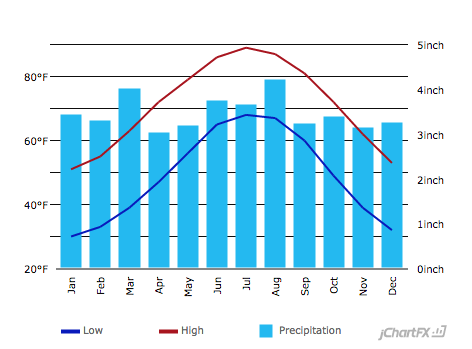 Winters are short and generally cool to mild, with a January daily average of 40.1 °F. Rain is frequent throughout the year, with thunderstorms in spring and summer. Overall, Charlotte’s climate is great for running year-round but be prepared for the summer heat! The majority of hotels are located in Uptown. Bank of America and Wells Fargo headquarters are located here. All of the ‘iconic’ routes in this guide are accessible from Uptown, with the Parks and Stadiums Loop being most convenient. A few hotels are located near the University of North Carolina at Charlotte. 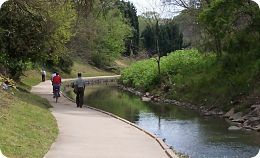 The closest route to these hotels is Mallard Creek and Clark Creek Greenway. 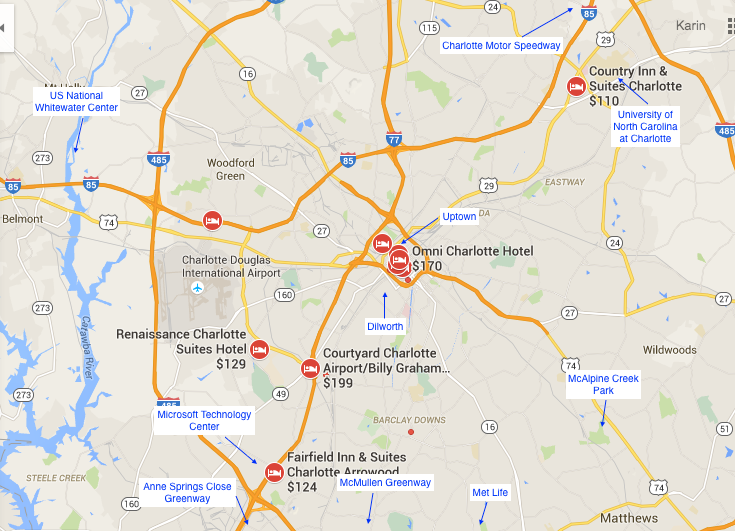 Additional hotels are located at the junction of interstate 485 and 77. From this location, the Anne Springs Close and McMullen Greenways are nearby. Finally, the Airport is located to the West of the city. If staying at an airport hotel without a car your best bet is to use The Charlotte Area Transit System (CATS) that runs from the Airport to Uptown. See running overview map for store locations. Click on it for location, directions, and details on group runs. Charlotte Running Co. Dilworth, South Charlotte, Northlake and Lake Norman. Group runs: from Dilworth Store on Monday at 6:30 Pick Your Distance Run — 4, 6, or 8 miles. The Ultra Running Company Myers Park and SouthEnd. The Ultra Running Company is the most trusted provider of holistic running knowledge, products and experiences in the market. Charlotte Running Club Offers a variety of group runs every day of the week. See website for details on meeting points and distances. Charlotte Runners Offers a multiple group runs every day except Wednesday. Numerous brewery runs offer visitors fun routes and delicious craft beers. See website for details on meeting points and distances. US National Whitewater River Ram Run on Thursday night runs. 1.5, 3, and 6 mile options. Stick around to enjoy the live music at River Jam. Meets at 6:30pm at the Trail Center. Charlotte has running events seemingly all week long. There’s almost always something. Charlotte Race Fest April. Half marathon, 10K, and 5K. Charlotte Marathon November. Formerly the Thunder Road Marathon. Also Half Marathon, Relay and 5K. Firecracker 5K July. In celebration of Independence Day. Charlotte 10 Miler February. Also a 4 mile run. 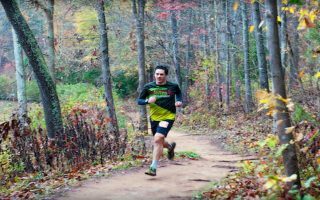 Trail Race 13, 9, 4 Miles January.